"Lewis's story is based on historical events surrounding the eruption of Paricutin volcano in a cornfield in Mexico in 1943, one of only a handful of times when the birth of a volcano was witnessed firsthand. Pablo's father, who is bored by day-to-day life in the village, gets a surprise one day while farming in a field when he sees a hole open in the earth. Fire and smoke pour out, ultimately forcing the villagers to relocate. Narrator Brian Amador speaks clearly with a slight accent that adds regional authenticity. Soft guitar music and sounds of the countryside also complement the story. Listeners can select a track with or without page-turning cues." "Thomas Lewis's beginning reader is based on actual accounts of the 1943 eruption of the Paricutin volcano in Mexico. Pablo's father, a farmer, has grown bored with his daily routine. One day, shortly after the boy arrives in the field to assist his father and their ox with the plowing, the volcano begins to erupt in the middle of the cornfield. 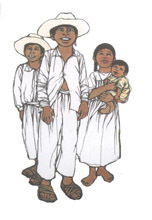 Their village becomes covered with lava and rock, and Pablo's family and the other villagers must relocate and rebuild. With the smoldering volcano called "El Monstruo," or "The Monster," in this distance, life continues much as before. Brian Amador's narration and Spanish intonations add authenticity to the tale and bring the setting and the characters to life. Gentle guitar strumming and subtle sound effects set the mood. Page-turn signals are optional. Listeners will be drawn into the story."